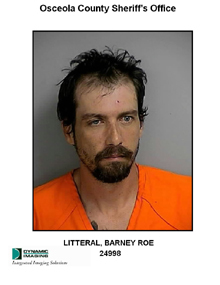 Osceola County — On November 27, Osceola County Sheriff’s detectives arrested Barney Litteral (DOB 6/26/84) for his involvement in an armed robbery at Knights Inn in Kissimmee. He was charged with Armed Robbery with a Firearm and Petit Theft. On November 26 at 6:30 p.m., Osceola County Sheriff’s deputies responded to Knights Inn, 2880 N. Poinciana Boulevard in Kissimmee in reference to an armed robbery call. Upon arrival, deputies spoke with the victim who indicated a male walked into the motel and demanded money from behind the counter. The suspect fled the area with an undisclosed amount of cash. Further investigation led to a witness who could identify the suspect. Detectives found Litteral at a local bar. He was charged and taken to the Osceola County jail. 1 Response to "Detectives Arrest Knights Inn Robbery Suspect"